Motor and sensory including tone: Comprehensive motor and sensation examinations should be performed. Myelopathy signs such as spasticity and hyperreflexia should be sought. In central cord syndrome, dissociated sensory impairment is usually evident on examination. Seek signs of brainstem involvement: If syringomyelia extends into the brainstem (syringobulbia) or when it is associated with Chiari malformation, there is often involvement of cranial nerve or cerebellar function. CSF analysis unusual: CSF analysis is not routinely recommended. When it is obtained, the cell count is usually normal and the protein count might be mildly elevated. 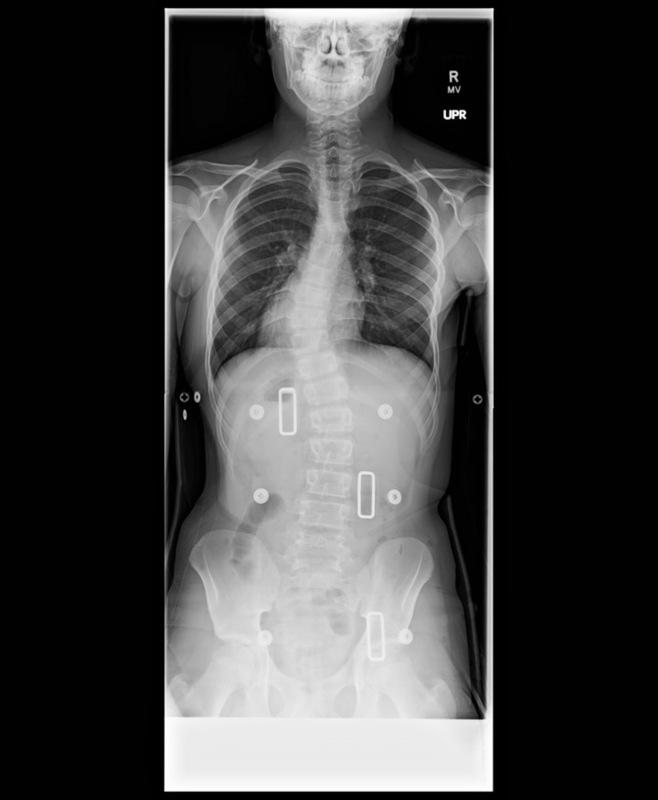 Only for assessment of scoliosis: There is no role for plain radiographs in the diagnosis of syringomyelia or associated conditions. Plain radiographs are primarily used for assessment of scoliosis. CSF cavity on T2-weighted imaging: Imaging may show a dilated cavity with the same intensity as CSF on T2-weighted imaging. 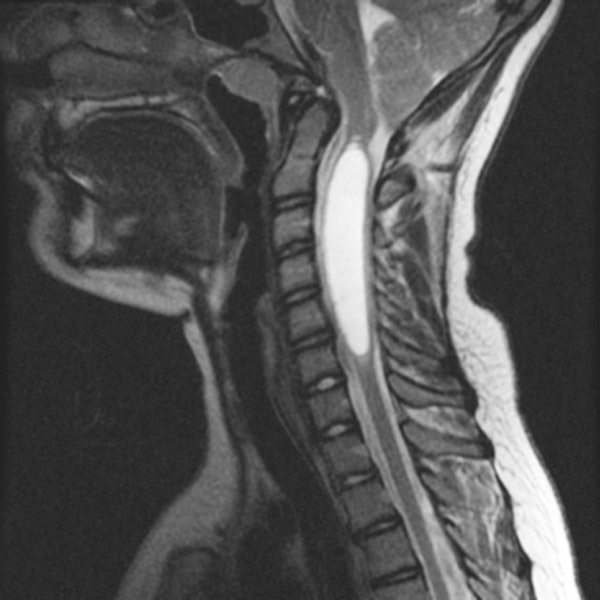 T2-weighted sagittal MRI of cervical syrinx: Note the large upper cervical syrinx expanding the cord diameter and an associated Chiari I malformation. Evaluate entire CNS axis: If a syrinx is found on routine MRI, further imaging studies should be sought to determine the primary etiology of the syrinx. This should include a complete brain and spinal MRI with and without gadolinium. Cine MRI: Cine MRI may also help in diagnosing abnormal CSF flow patterns, but so far results have been conflicting. Not routine: Neurophysiology tests such as SSEPs can show low-amplitude or delayed responses in cases of myelopathy. Motor evoked potentials may be more sensitive than SSEPs in the evaluation of spinal cord dysfunction. Neither is routinely obtained. Imaging for size and symptoms: The most difficult problem is to distinguish between symptoms related to the syrinx and those related to the underlying etiology. Nonetheless, the presence of a large syrinx warrants treatment regardless of symptoms. Small syrinxes may be followed with serial imaging.